In Class 5 we have Miss Holme and Mrs Lavercombe. In Class 4 we have Miss West and Mrs Down. We work closely together as a Year group throughout the year. Please keep an eye on the website for updates throughout the year. We enjoyed dressing up as our favourite authors, characters and comic book heroes! We enjoyed learning all about our favourite books and why they were our favourites. We enjoyed learning all about India this week as part of Arts week. We learnt how to dance just like a Bollywood dancer. We were able to move to the music and appreciate music associated with Bollywood. As part of this day we learnt all about the Indian Rainforest. We are beginning to create our own Rainforest in the corridors - watch this space! We enjoyed using pastel to create these bright animals. We have enjoyed sharing with you the Christmas play this year. We have enjoyed learning the dances and songs together. In Class 5 we have designed and built our very own Gingerbread houses! See if you can spot yours..? Our memorial for Remembrance Sunday. As a Year group we created our own memorial to remember all the people who look after us every day. We worked as a team to create our own memorial. Year 1 enjoyed meeting Button after hearing so much about her this week. Miss Holme explained what she does to look after Button - including brushing her teeth. We all enjoyed giving Button a stroke and saying Hello to her. We learnt a lot to help us write our own pet fact files soon. We have been learning the story 'The Woods'. We have been learning it through a story map with actions. You could practise this at home by following the children from Class 5. We had a lovely day trip out to Rosemoor. We learnt all about mini-beasts and their habitats. We discussed how the mini-beast likes to protect itself under rocks and other areas in the woods. We even spotted a live hatching event of some woodlice being born! The Year 1 Car Wash! We have been learning how to write our own set of instructions on how to was a woolly mammoth this week. We even found a woolly mammoth footprint! We thought we could use our skills of writing instructions to write our own set of instructions on how to was a car. Miss West let us borrow her car to test run our set of instructions! We really enjoyed celebrating the Royal wedding as a whole school. We had our own garden party and we danced along to some Royal songs together. We enjoyed making our own crowns for the wedding including designing our own crests based on what means the most to us. Over the past couple of days we have been learning the story of Jack and the Beanstalk. We have also planted our own beans... but one day a huge beanstalk grew in Class 5! Can you believe it? Luckily we added on our own leaves to the beanstalk including our very own adjectives to describe the beanstalk. We will keep you updated on how our 'real' beans grow. Please find below a copy of the newsletter for this term. We really enjoyed learning all about tennis and gymnastics this morning with Naomi and Rob. We learnt how to do 3 different shapes in gym and how to control the ball in tennis. We can't wait to start the morning and after school clubs with Rob and Naomi! We really enjoyed learning all about China today. We started off the day by learning how to use chopsticks. We found this very hard at first but once we knew what to do we were extremely pleased to finally eat our fruit! We also enjoyed learning all about the art of dragon dancing. We can't wait to make our own dragons to practise our new dance moves! We really enjoyed building our own bridges this week. We had to think about how to make a strong enough design that a car could go over. This will help us when we begin to build our own Great Walls of China this term! Today we walked around Pilton Park and looked for signs of Autumn! We were able to find lots of leaves that had turned brown and there were no leaves on the trees. We also took our own photos using the Ipads, can you find your photos? SCIENCE - The Best Superhero Cape in the World! Our science topic this term is materials and we have been helping Superman and Superwoman to find a new cape. It needed to be waterproof, light, strong, fly well and look good enough for a superhero to wear. The children designed and made capes to test outside by running across the playground, dipping them in water, ripping them and watching how they flew. The children then evaluated the capes and the winner was a plastic bag! We have enjoyed dressing up as superheroes and real life heroes! We have had visits from the police and the RNLI. We have learnt about how they keep us safe in the community. We learnt what to do if we were in trouble at sea and even caught a lift into shore on a life boat! Year 1 had a fantastic day at RHS Rosemoor. The children had chance to explore the woods and gardens looking for different colours to make a colour wheel. They also attended a 'Stimulate the Senses' workshop where they tasted different fruit and vegetables, listened to the sounds outside and made a feely box of various items from the gardens with the same texture. Finally they made their own 'smelly cocktail' using different bits of plant that they found in the gardens... some smelt delicious! 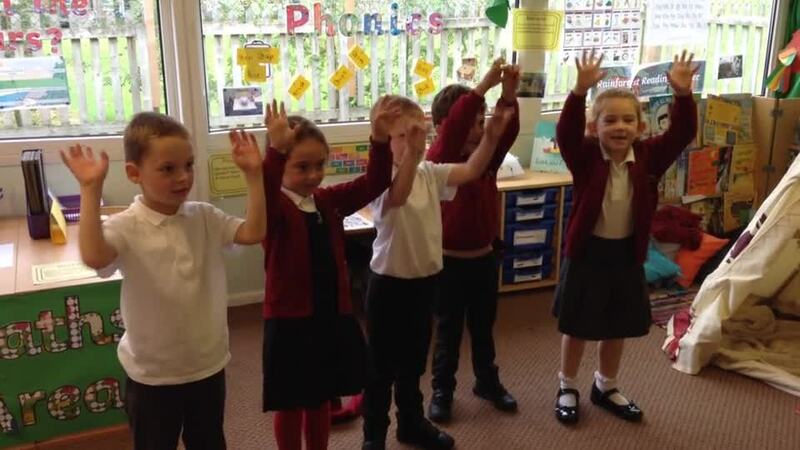 The children from Year 1 were excited to play the part of chickens in Reynard Fox. We all worked very hard to remember our lines and the different parts we played. The whole of KS1 came to see the play last week and thought it was fantastic! The children enjoyed working alongside the children from other schools in Pilton! Well done everyone! We all dressed up in red to support Red Nose Day, including our Red Noses! We learnt about how the money raised today will go to those less fortunate than ourselves. We all dressed up as different animals, explorers and even the Northern Lights! We learnt a lot about penguins and how they huddle to keep warm. We had a great day learning about both the south pole and north pole! Here are some photos of our brilliant Year 1 dancers! As a school we all celebrated the 100 years since Roald Dahl's birth. We all came to school dressed up with costumes ranging from Witches to Fanastic Mr. Foxes! We had a great day learning all about the different books he wrote and the amazing characters within them! Eight children from Year 1 recently took part in a production of the Firebird alongside children from the other Pilton schools. They performed exceptionally well for their peers, parents and the other schools. We had a fantastic week of science in Year 1. Ruth from Sciencedipity came to visit and taught us all about microbes. We all made A POT OF SNOT! Also our own microbes. We learned why it is important to Catch it! Bin it! Kill it! when we sneeze. We also investigated how orange juice, coke and water affect our teeth using egg shells to act as teeth. Finally, we made our own toothpaste and saw the importance of brushing for two minutes to remove ALL the food and plaque from our teeth. We have learning about people's jobs for writing an information book. We have been lucky enough to be visited by two gardeners from Marwood Hill Gardens and a veterinary nurse from Charter Vets. The children wrote questions and interviewed these people to find out what they do. Year 1 children found out all about life in a castle, the history of Dunster castle, the story of the Dunster Dragon and how to joust! It was a fantastic day, enjoyed by all the children. Many thanks to the parents that helped. We dressed up as some of our favourite book characters and also shared our favourite books with friends. To support our science topic on classifying animals, Year 1 enjoyed a fantastic day at Exmoor Zoo. We saw a range of reptiles, mammals, birds and even a few arachnids! The children saw cheetahs being fed and some held a Bird Eating Spider or stroked an Alpaca. Year 1 was invaded by all manner of space creatures, planets, machines and astronauts. Well done for some fabulous costumes! Please find below, the Year 1 newsletter for the autumn term. We are learning about "Our Beautiful World" and our geography focus started with our immediate area. The children enjoyed exploring the Secret Garden, (see pictures below) looking for different types of plants and flowers. Then we linked this with our Art to draw flowers using lots of different media, including paint and pastels. On St George's Day we learned about the different parts of Britain and finally we moved onto the continents and learning where to find them on the world map. The Zoo comes to Pilton Infants' School! As part of our topic on Our Beautiful World we have been learning about animals. This week Exmoor Zoo brought a selection of animals to school so we could look at them, touch some of them and learn all about their features. We were a bit nervous about the snake but some children were very brave and touched them. They were surprised that they were so smooth and not slimy at all! Our favourite animal was the baby owl. Mrs Roberts got to hold it! In the Autumn term our topic was Explorers. We wanted to learn about explorers and to become explorers ourselves! We wanted to learn about environments beyond our school so we visited Northam Burrows and explored two contrasting environments - sand dunes and rock pools. When we explored the rock pools we found crabs, limpets, mussels, shrimps, sea anemones and tiny fish. We tried hard to walk carefully around the rock pools so we didn't disturb the habitats. When we explored the sand dunes, the children identified ladybirds, beetles, spiders and evidence of rabbits! We also spotted birds and lots of different flowers. "We were nature detectives today!" "I found out that plants and animals live in lots of different places, not just in the countryside." We visited Longleat Safari Park. We had a fantastic day! We handled some African animals. We learnt about Africa and we held an Africa day. We all dressed up, learnt songs, dances and made musical instruments, it was one of the best days ever! Click on the photos below to look at some of our learning in Maths, Science and PE. We have lots of fun in Year One and we are always learning new things through real life experiences and practical tasks. We have been using the writing toolkit that was developed by Year Two. It helps us to become more independent when we are writing. Each toolkit area has an action and a symbol to focus our writing and we use it to edit and improve our written work. Here are some examples from the Year One toolkit. During the Summer term we are learning to improve our football skills by working alongside the coaches from Chivenor Soccer School. More details and photos to follow.